Clare gets back to her craft! It’s been a busy year so far for me for one main reason, my little boy Peter! Peter arrived in December, just before Christmas so the start of the year passed in a blur. Now things have settled down and I’m ready to start making my designs again. I’m really excited to be getting my hands covered in clay and working on my craft again. I’ll be restocking all the designs that have been steadily moving off my shelves and off to the post office in the last few months. The first design which needs stocking up is the Patchwork Vase. Clare will be exhibiting at Maison & Objet in Paris this January. Maison & Objet is an international trade fair so it will be a change for more shops from around the world to find out about Clare’s designs. 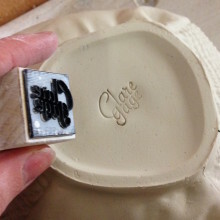 This year was the 4th time Clare had attended the British Craft Trade Fair. It’s a great show with so many talented exhibitors.